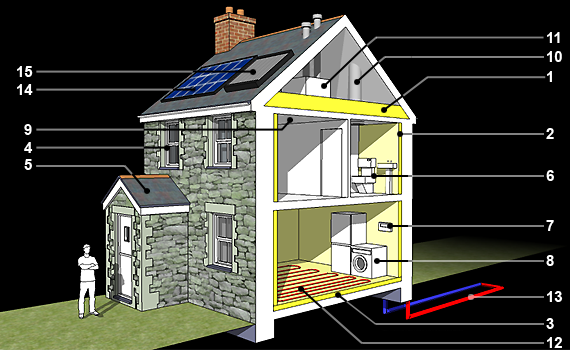 Retrofit / futureproof - old housing stock with new low energy systems. This guide gives some idea of appropriate measures to save and create energy, some of these may be achievable (some at very low relative cost). Click here to view a real retrofit where a 95% reduction in CO² emissions	has been achieved. Most of the houses in the UK are old, draughty, poorly insulated houses that have been around a long time and are likely to be around way past 2050 - the date by which the Government has committed the UK to an 80 percent reduction in carbon dioxide emissions. The vast majority of the country's almost 27 million homes will need low-carbon retrofits, primarily thermal upgrades and more efficient heating systems. With rising fuel and energy prices fuel independence is also becoming an issue. Click here to view a printable version of this guide. To view this link you will need the Adobe reader plugin installed. Click here and follow instructions to install this plugin if you do not already have it. The first place to look to stop heat loss from a building is through the roof. This is usually the easiest place to start as many roof spaces are easily accessible making this a very quick and cost effective way to reduce heat loss. Many existing houses have by modern standards an inadequate degree of thermal resistance in the walls. The issue will usually be that either the existing walls are solid or any moderate cavity that does exist is already filled with insulation but not enough to provide a substantial thermal resistance. The solution is an additional layer of wall insulation fixed either internally of externally. A layer of insulation with a rendered or other external finish applied to the exterior of a building may be the easiest and best solution because the layer can have a greater continuity than internal wall insulation that has be worked between internal walls and floors. The issue in much of the West of Cornwall is the protected nature and external appearance of the traditional stone built buildings, this will usually mean the implementation of internal wall insulation is the only option. Not an immediately obvious place to expect heat loss from a building but once the walls and roofs have been insulated the floors are the next place to look at (particularly if you may also intend to install underfloor heating also). Insulating some floors can be quite problematic but where it is done and done properly it is well worth it. Suspended timber floors offer the easiest and quickest means of introducing insulation beneath the ground floor and it can simply be installed between and beneath the existing floor joists. Solid floors are a different matter as it can raise problems when increasing the finished floor level by laying new insulation over existing floors, the alternative is to excavate the existing floor which can be disruptive and costly. Once all of the buildings surfaces (walls, roofs and floors) have been considered the windows should be addressed. Triple-glazed windows and doors are preferable to double-glazed, with well sealed installation to avoid draughts and air leakage (especially important if you consider installing a Mechanical Ventilation and Heat Recovery system). The addition of an insulated lobby to the building can greatly reduce heat losses caused by the user entering and exiting the building besides being very useful in separating the interior comfort of the building from poor weather conditions outside. It may be easier and cheaper to create a lobby on the interior of the building but quite often there simply is not the room to do this. Fitting reduced flow bathroom fittings such as taps and shower heads, and using a dual flush toilet can greatly reduce water usage as well as demand for hot water. This is not so much a measure to directly reduce energy usage but installing a console that displays the electrical consumption rate throughout the home can be informative. Peaks and high levels of electrical usage may help identify areas where greater efficiencies can be achieved. Installing energy efficient appliances (A++ electrical) such as washing machines and fridge freezers can further reduce electrical demands. Generally it would be expected to replace these type of appliances after a few years and so may need replacing in your home sometime soon. Fitting low energy lights and light fittings can be very simple and mean fitting low energy bulbs in existing sockets or the wiring of new light fittings to take alternative types of bulb such Light Emitting Diodes (LED's). Natural daylight is mostly preferable in the interior of a building rather than requiring artificial lighting, and the less lights need switching on the better. Windows, glazed doors and roof lights may provide the solution for the majority of rooms but for some internal rooms, usually bathrooms or store rooms, this is not an available option. A sun pipe is maybe an alternative and can allow daylight to penetrate into the heart of a building via reflective pipe work. Sun pipes can also be integrated with a passive means of ventilation which is very useful for bathrooms (not to be used if the house will have a Mechanical Ventilation and Heat Recovery system). An MVHR system requires the installation of a heat exchanger, usually in the roof space This exchanger will intake outside air and preheat it with the air that is being extracted from the buildings interior. A system of pipes will lead from the exchanger to a vent in each of the habitable rooms of a building. This is a very good way to maintain ideally adequate levels of ventilation to all rooms while greatly reducing heat lost by simply expelling warm air. Some of these recovery systems can have an efficiency of 90 to 95%. The important thing is that firstly the building is well insulated and also has been made reasonably air tight else the efficiency of these systems cannot be realised. Underfloor heating, as well as being very comforting, is a very good way to heat an interior. Convection currents and draughts are lessened when compared to heating a room using radiators. Also liquid underfloor heating systems run at much lower temperatures than is required by radiators and when set in a heavy floor screed or slab will also create a thermal mass that will provide a more controlled air temperature in the room. A liquid underfloor heating system can be integrated with the hot water system using a thermal storage tank, which can also be integrated with solar thermal panels and aground source heat pump. A ground source heat pump also works well with liquid underfloor heating as it is most efficient as generating the relatively low temperatures required. As with the installation of floor insulation into old houses, there is an issue with floor levels when looking at installing under floor heating. There are electrical underfloor heating systems available and while they are easy to install and provide similar comfort levels to a liquid system they cannot be integrated with the hot water system and there is some question of their efficiency. A ground source heat pump utilises pipes that would be buried in the ground. A mixture of water and anti-freeze circulates around a loop that is either buried horizontally in a trench or if space is limited is buried vertically in a bore hole. Warmth from the ground is absorbed by the loop and is pumped through a heat exchanger and is concentrated to create higher temperatures to heat hot water. Heat pumps do need electricity to run but the heat they extract from the ground is sustainable, and beneath the surface the ground stays at a fairly constant temperature so the system can be efficient throughout the year - even in the middle of winter. A heat pump delivers relatively low temperatures and this makes it a very compatible system when combined with under floor heating. Ground source heat pumps can also utilise a body of water, such as a lake or river, where a loop or open pipe system can extract warmth from the water. There are also Air Source Heat Pumps which can be fitted to extract heat from the outside air and generally perform better where air temperatures are warmer. Air source heat pumps can also work in tandem with MVHR systems. Photovoltaics or PV's are panels designed to be fitted to the exterior of a building or located nearby, oriented as best as possible so that they face the path of the sun. The panels are made of semiconducting materials in a way that when light shines on the panel an electric field is created. The stronger the sunlight the greater the amount of electricity produced. Installing solar PV's will reduce the demand for offsite electricty supply, reducing electricity bills. If a PV array is of sufficient size and on site usage of electricity is low then there is also the opportunity of selling electricity back to the grid. The instalation of photovoltaic panels would not normally require planning permission, as long as they are below a certain size. If your property is a Listed Building or in a designated area such as a Conservation Area then planning permission may well be required. Solar thermal panels like PV's are designed to be fitted to the exterior of a building to face the path of the sun. There are two types, evacuated tubes and flat plate collectors both of which are designed to collect heat from the sun and use it to warm water. This water can then be stored in a hot water cylinder or thermal storage tank for use in the heating or hot water system in the house. This is a very simple system and can produce good efficiencies throughout the year although best returns will be during the summer months. As with PV's - solar thermal collectors would not normally require planning permission, unless the building is Listed or is in a designated area where 'permitted development rights' do not apply. There is no shortage of organisations that can help you work out your house's energy efficiency and decide what to do, from the easy, cheap DIY jobs to the more involved (and more expensive). For further advice a good guidance it is worth visting the Energy Saving Trust website.